Despite the New York Rangers’ problems on defense, they possess undeniable offensive skill. This skill started with the induction of center Mika Zibanejad into the lineup. Zibanejad is slowly taking on a Derek Stepan-type role, and it is making a good, noticeable difference. Zibanejad’s right handed shot is reminiscent of Stepan’s, hard and fast. When Stepan started out his NHL career he rapidly became aware of his skilled shot. (This was probably due to scoring a hat trick in his first game.) 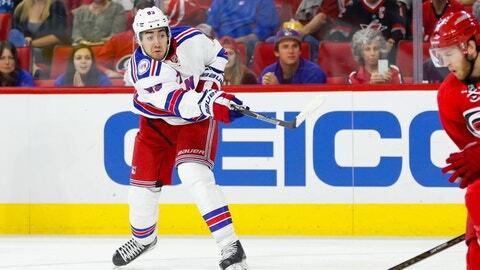 Zibanejad, in his seasons with the Senators and inaugural season with the Rangers, is also becoming aware of his talent. He is capable of securing his role as a top six forward, as Stepan has done over the course of his career. Putting aside the fact that Zibanejad hasn’t been able to prove his abilities the way he would have liked, he has still proved his reliability night in and night out. Another defining point in proving that Zibanejad is acquiring a role like that of Stepan’s is his ability to play on the special teams. In playing only half of the amount of games as Stepan, Zibanejad has totaled five power-play points to Stepan’s ten. That’s a respectable amount, considering his absence. Also, much like Stepan, Zibanejad is a vital part of the Rangers’ penalty kill. He’s strong defensively but provides an offensive touch, as well. That offense has the ability to give the team momentum after a good kill. Zibanejad is definitely taking on the role of Derek Stepan in many ways, and it’s undoubtedly beneficial to a team that bases themselves on speed and offense.